SK841 - 8 to 2 gauge Cu/Al wire rated to 600v. SK842 - 1 gauge to 250 MCM Cu/Al wire rated to 600v. Includes single conductor mechanical connection. 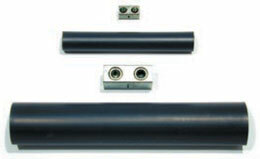 Includes UL listed shrink tube required in making connector system splice.